Site performance is a major factor when it comes to designing and user experience. Eventhough your site loads fairly well on your computer, there are more people around the world who has internet connections with lower bandwidth. They will really freak out if your pages take few more minutes to load completely and may be never come back. So you are not alone and need to think about more broader aspect. The more content you add to your pages will reflect slower performance of your pages. However, typically, text doesn't pose you a greater risk for your page performance. Content by means it could be images, scripts, styles and any kind of stuff you added for your pages. Heavy content leads to a chaos where it takes more time to load your pages and readers have to wait some more time before they view your content. Absolutely, visitors will get a bad impression about your site. Specially, new visitors. Either you may have no idea about how to increase performance of your site or you may have already did try few tips on it. Did you? Google offers you a simple and powerful online tool to analyze your website or blog performance - Google PageSpeed Online. Google's PageSpeed Online analyze your content against their rules and provide you optimization suggestions to reduce your page load time by overcoming obstacles affects to page performance. It will runs a number of diagnostic tests against your page and provide suggestions to optimize not only the desktop version but also mobile version of your blog or website. The report will come up with a PageSpeed score which indicates how how much faster is your page according to PageSpeed rules. Higher score means you are doing well and lower means you need more attention. It categorize problems affect on your pages into High Priority, Medium Priority and Low Priority sections where you can find out which needs more attention to improve performance of your pages. Further you can find possible solutions with depicted suggestions. Google's PageSpeed Online tool uses specific rules to identify problems on your pages and it doesn't include all suggestions to improve your page performance. I mean each and every suggestion. They update their rules time to time and you don't have to worry about it. Sometimes it's just the variation of server communication and that's why your page load times not constant always. So your report or score could be change accordingly. However you don't have to get rid of all of them. For example if PageSpeed Online tool suggest you to remove a widget or script from your site and if it's must-have widget on your page, then you don't have to remove it at all. Or try alternative if you can. In that scenario you should think about which would be critical to your blog or website - Performance vs Productivity. Generally, whenever you use a tool, just try to make use of it for good and do not depend on it. Interested in PageSpeed Online? Let's run it for your blog or website. 1. Visit PageSpeed Online website. 2. Enter URL of your blog or website you would like to analyze in the given text box . 3. Click Analyze button to start performance analysis. 4. After the analysis, you will be directed to the result page with overall PageSpeed score according to Google PageSpeed rules. There you will able to find suggestions regarding your page content to improve your page speed with possible solutions. 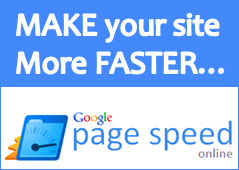 * PageSpeed score is a indication how how much faster is your page according to PageSpeed rules. Higher score means you are doing well and lower means you attention needs on improving the overall performance. * You can switch among Desktop and Mobile to view relevant analysis report using corresponding buttons on top right of the website. I've never found this to be consistent Mayura, at least not for me. I've only had one person ever tell me my blog loaded slow but I think at that time it was his internet connection. I'm sure there are plenty that load a lot faster than mine but every time I test it at one time it's one thing, another time it's something else and so on so I never know what to believe. Oh no Adrienne :) I'm with you on this. It happens for my blog too :) That's why I've mentioned this report could be different time to time... But still I'm using it for my blog. The reason is as you analyze your site, if you look closer, you will see something common in it. Just ignore new suggestions pop up time to time :) Just look after suggestions you see common on each report. However sometimes blogs or website performance can be affected by browser extensions or plugins too. I've experienced it myself :) Some readers sent me feedback of my site loading time. But the problem was plugins they were using on their browsers. Personally, I don't see performance problem on yours and you've managed to have only few elements on your site. As I analyze your site on PageSpeed just now, you have lower usage of scripts and styles. Those are cause by your share buttons only. You can't get rid of images and styles on your pages. Everything is fine for you. I don't think you have anything to deal with. Wow... Really? ;) So you did it perfectly on your blog. No worries about performance ;) Just had a look at you blog and yeah, it's really loading faster.